Our REALTORS® can help you see inside every Edinburgh, Indiana house listed by any real estate agent or broker. When you find a home you'd like to see, submit a showing request or call us. Get Edinburgh automated home sale updates. Home build site in the rural, southern Shelby County! 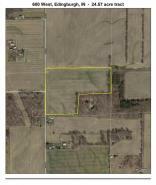 2.45 acres of ground ready for your dream home! Come build your dream home on this 2.85 acres in southern Shelby County! Property has three out buildings, to include a small and large pole barn with plenty of storage. Near I-65 for easy access to Columbus and Indy. Rare vacant lot with potential for duplex/multi family construction!!! Zoned for Local Business. Investment property or start your business on this property!!!! Level lot with all utilities available including gas. Build-able lot in area with low inventory. Lot is ready for new construction of single family custom home. Original survey pins have been recently uncovered. Browse Edinburgh Neighborhoods or find Edinburgh Open Houses coming up this weekend. Look for Edinburgh Foreclosures, HUD, & Bank-Owned Homes for sale, or look for Edinburgh Water Front Properties. You can also view Off-Market Homes or search Edinburgh Homes for sale by Street Address.